I’m going to throw out a few ideas for those of you who aren’t emotionally suited to be investors and have to take the traders path. First off realize that miners are volatile. That means position sizes will necessarily have to be small. As a trader you never want to lose more than 1-2% of your total portfolio on any one trade. So you probably aren’t going to be able to trade more than 20% of your account in any precious metal position. 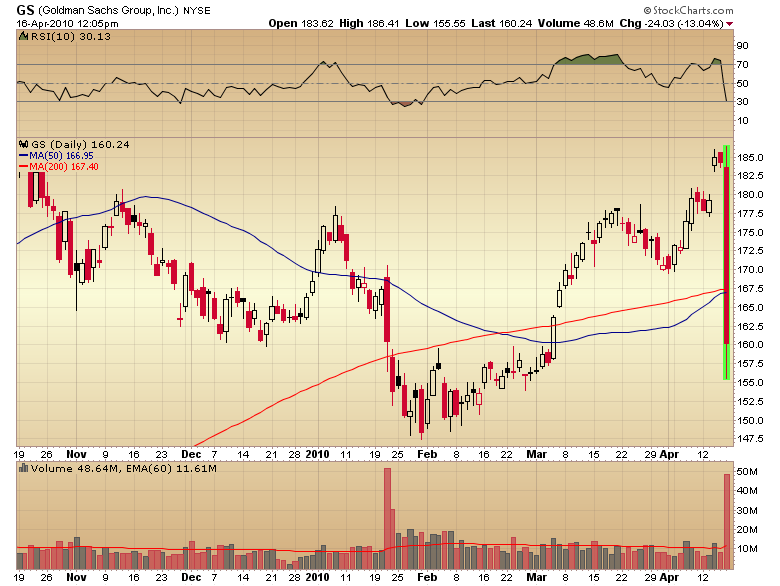 Even the ETF GDX can easily swing 10% in the blink of an eye. If you have a 20% position and it goes against you by 10% you have hit your -2% maximum loss on your portfolio. Also be aware that taking 10 mining positions isn’t really diversifying as the sector tends to move in concert. What you absolutely can not do is take a 100% position with the intent of trading. Locking in 10% losses in a bull market just isn’t going to be a profitable way to make long term money. If you are going to trade then your main concern, actually your only concern will have to be limiting losses (risk control). Let the profits take care of themselves all you care about as a trader is limiting losses. Next I want to point out something that is or should be obvious but probably isn’t for most traders. Trading isn’t about getting the direction right. Hell that is easy. No trader has any business trading against the cyclical trend. It just doesn’t make any sense to handicap oneself to that extent. This business is tough enough even with all the odds in your favor. Trading against the trend is like playing poker and having to show your hand to your opponents. Sure you might win a few hands now and then but the odds are really high you are going home to tell your spouse you lost the mortgage. If you are going to be a short seller in a bull market then you better be digging into the fundamentals of the companies you are shorting. If you are shorting in a bull you had better be selling sick or broken companies. Let’s face it that is the only way you are going to get any kind of advantage and even then the pull of the bull can still mask the disease in many unhealthy companies. The financials are an excellent example. Most of them are for all intents and purposes insolvent but because of accounting changes and free money from the government along with implied protection one would have to be crazy to sell short any bank stock. There were only 10 new lows on the NYSE yesterday. Trying to short high flyers in a bull market is a fools game and as you can see there aren’t a heck of a lot of potential short candidates in bull markets. So unless you are willing to do the due diligence needed to find cancer patients one really should bypass shorting selling. Wait till the bear returns. That is the time to sell short. No, trading isn’t about getting the direction right, like I said that one is easy. Trading is about getting the timing right. What a trader wants is to time a swing and then get out. If a trade goes against him it’s not because he’s picked the wrong direction it’s because he mistimed the trade. If the trader is willing to be patient the bull or bear will eventually correct the timing error. When a trader stops out he is admitting his timing was wrong not direction, and he thinks he can exit the trade for a small loss and enter another trade where he hopes his timing will be better. So if one is going to trade understand what you are doing. You aren’t trying to pick direction you are trying to guess timing. Know that history has shown this is very hard to do on a consistent basis and you certainly don’t want to handicap yourself by trading against the large trend unless you have intimate information about the companies you are trading counter trend. This entry was posted in Uncategorized on April 30, 2010 by Gary. I think it may be time for the miners to start outperforming the stock market again. I know when one looks at that semi parabolic chart of the S&P for the last two months it certainly appears that buying miners has been a poor choice. 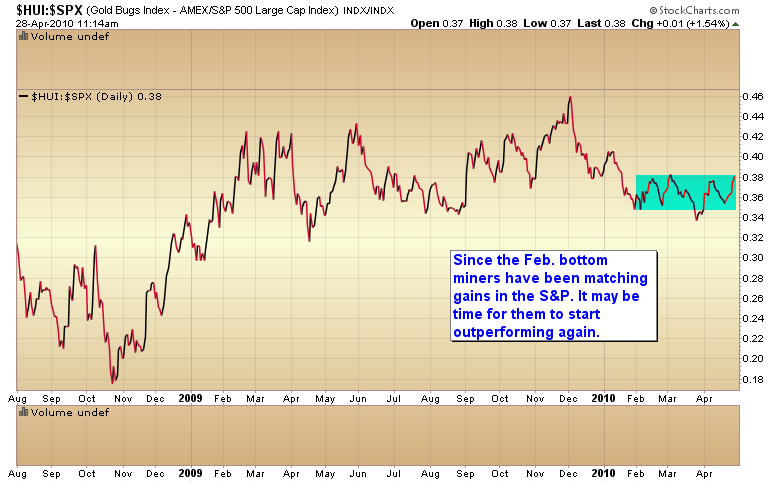 The reality is that miners have matched the gains in the S&P although they admittedly have been more volatile. Of course that’s just par for the course in this sector and one of the things precious metal investors just have to accept. One of the things I’ve learned over the years is that this sector has a very sneaky way of boring everyone to tears, then just about the time you get fed up and leave the sector shoots straight up for a couple of weeks. If you are out you miss the move. Then about the time everyone panics back in the sector enters another consolidation. The only way to avoid missing the move is to just stay in. That means you are going to have periods that try your patience but ultimately the reward is worth the wait. This entry was posted in Uncategorized on April 28, 2010 by Gary. Here is the problem with trading. Most of the time any market will be in consolidation mode. Gold is a good example. 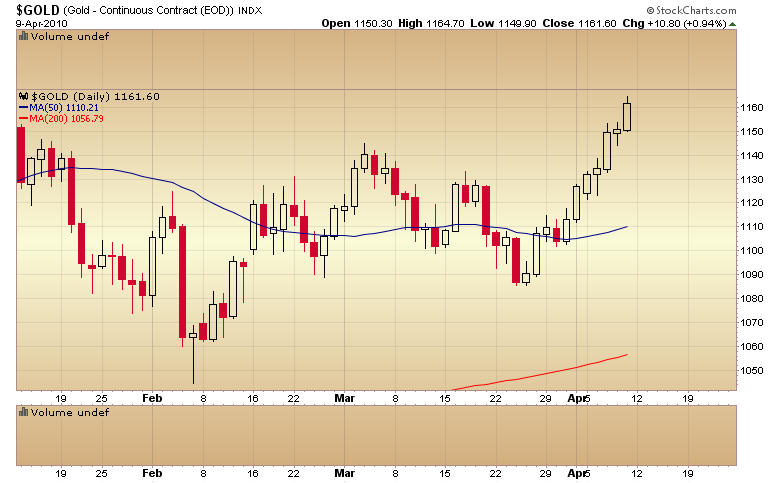 For the last 5 months gold has done nothing but trade back and forth with no defined trend. It’s very tough to make money in those conditions. Now don’t get me wrong somewhere someone will have traded this perfectly. They will have stumbled upon the perfect system to catch each little wiggle. Often they will proclaim their superiority loudly for all the world to hear. Unfortunately there really is no holy grail of investing and the system that happened to work this time will almost always fail during the next period. It’s just how the markets work, conditions change. So unless one is lucky enough to guess what will work before each new period in the market what invariably happens is one ends up giving back all of the gains they made when their system breaks down. The answer of course is to just stay aligned with the secular trend and accept that there are going to be periods when one will just have to sit and watch other people make money. The last five months have been a perfect example as the stock market has gone up while precious metals and miners have gone nowhere. Know full well that eventually this too will end as gold is in a secular bull market with a long way to go and the general stock market is in a secular bear market with limited upside potential. 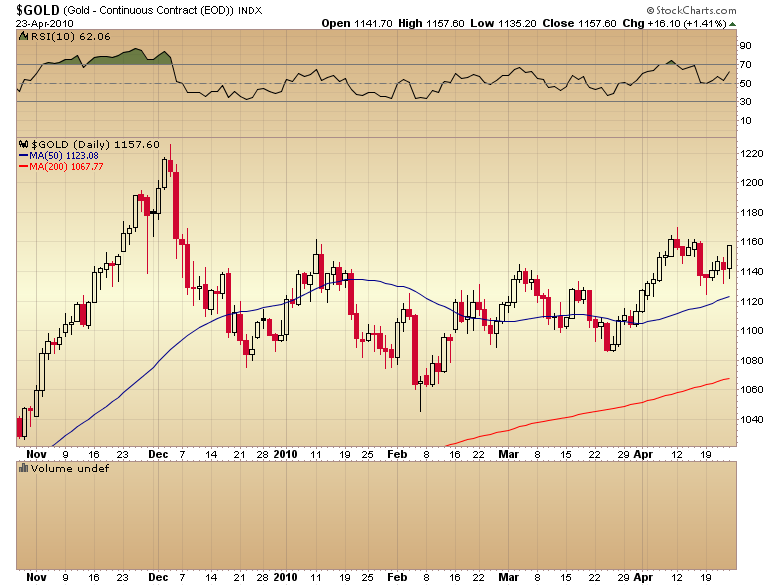 So at some point gold and miners will make another big move up and all the waiting will have been worth it. And at some point the stock market will come grinding back down and all those who held on expecting conditions never to change will lose all of their profits. So one can trade if they must, but do so knowing that the market is going to take away any and every profitable system at some point whether it be a technical system, patterns, cycles, indicators, sentiment, COT or just intuition. I’ve watched it happen to countless “traders” over the years. The really good traders survive these periods because they practice excellent risk management. Unfortunately most retail traders when they get on a hot streak believe they have found the secret to the market and risk management goes out the window. That’s just about the time the market starts throwing curve balls. This entry was posted in Uncategorized on April 25, 2010 by Gary. I love this story from Reminisces of a stock operator. It is so appropriate as the second phase of the gold and silver bull get underway. “Most let us call’ em customers — are alike. You find very few who can truthfully say that Wall Street doesn’t owe them money. In Fullerton’s there were the usual crowd. All grades!Well, there was one old chap who was not like the others. To begin with, he was a much older man. Another thing was that he never volunteered advice and never bragged of his winnings. He was a great hand for listening very attentively to the others.He did not seem very keen to get tips — that is, he never asked the talkers what they’d heard or what they knew. But when somebody gave him one he always thanked the tipster very politely. Sometimes he thanked the tipster again — when the tip turned out O.K. But if it went wrong he never whined, so that nobody could tell whether he followed it or let it slide by. Time and again I heard him say, “Well, this is a bull market,you know!” as though he were giving to you a priceless talisman wrapped up in a million-dollar accident-insurance policy. And of course I did not get his meaning. Elmer looked suspiciously at the man to whom he had given the original tip to buy. The amateur, or gratuitous, tipster always thinks he owns the receiver of his tip body and soul, even before he knows how the tip is going to turn out.”Yes, Mr. Harwood, I still have it. Of course!” said Turkey gratefully. It was nice of Elmer to think of the old chap.”Well, now is the time to take your profit and get in again on the next dip,” said Elmer, as if he had just made out the deposit slip for the old man. Elmer Harwood threw up his hands, shook his head and walked over to me to get sympathy: “Can you beat it?” he asked me in a stage whisper. “I ask you!”I didn’t say anything. So he went on: “I give him a tip on Climax Motors. He buys five hundred shares. He’s got seven points’ profit and I advise him to get out and buy ’em back on the reaction that’s overdue even now. And what does he say when I tell him? He says that if he sells he’ll lose his job. What do you know about that?””I beg your pardon, Mr. Harwood; I didn’t say I’d lose my job,” cut in old Turkey. “I said I’d lose my position. And when you are as old as I am and you’ve been through as many booms and panics as I have, you’ll know that to lose your position is something nobody can afford; not even John D. Rockefeller. I hope the stock reacts and that you will be able to repurchase your line at a substantial concession, sir. But I myself can only trade in accordance with the experience of many years. I paid a high price for it and I don’t feel like throwing away a second tuition fee. But I am as much obliged to you as if I had the money in the bank. It’s a bull market, you know.” And he strutted away, leaving Elmer dazed. This entry was posted in Uncategorized on April 22, 2010 by Gary. Without going into detail if the market moves to new highs I think the odds are good that we have entered a potential runaway move similar to 06/07. I can tell you that during one of these moves you can just throw out virtually every tool as they all become pretty much useless. Sentiment didn’t work during this period. Cycles stretched to absurd lengths. The COT failed miserably. Technicals were worthless. Overbought was meaningless. 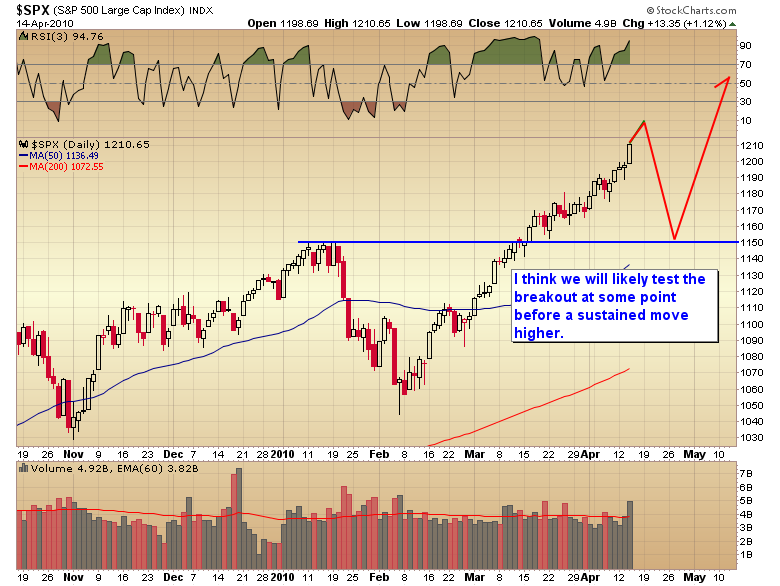 There are two signs to watch for as a clue to an impending top. Needless to say we don’t have either at this point and there’s no telling how long this could last if it does indeed turn into a runaway rally. 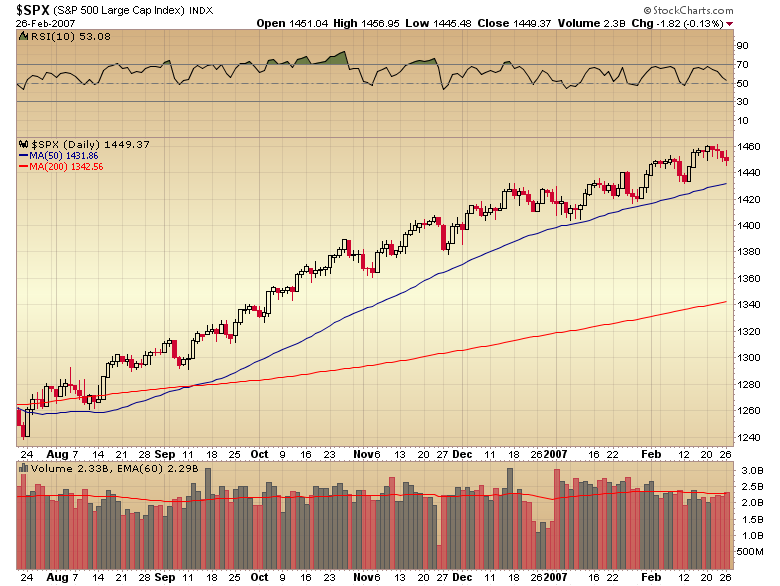 The 06/07 move lasted almost 7 months. This one is already 2 months old. Virtually all markets have now broken through any and all logical resistance levels. 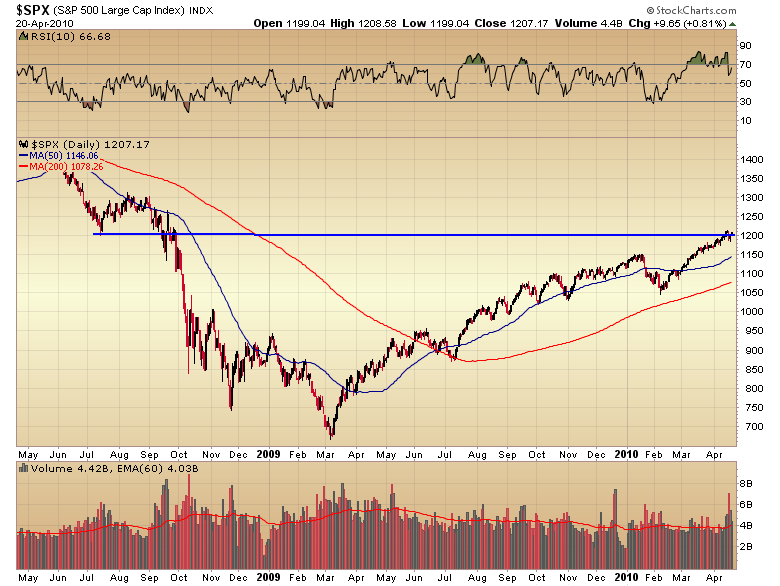 1200 S&P, 11,000 Dow & 2000 NDX just to name a few. I don’t actually expect the move to continue at the same pace as the last two months but it is showing all the signs of an impending runaway rally. Needless to say shorting something like this is suicide, although I think by now we’ve all learned our lesson about shorting this cyclical bull. This entry was posted in Uncategorized on April 21, 2010 by Gary. I’ve been expecting a stock market correction for a few weeks now. It may or may not have begun on Friday. We will need to see some follow through this week before we can say for sure. At some point I expect a big whoosh down. It’s how these extreme momentum moves often end. 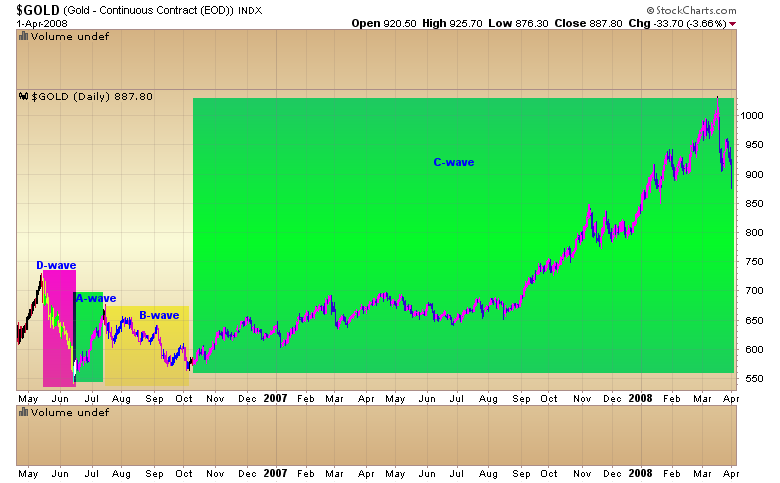 Gold also appears to be moving into a cycle low. When that big whoosh comes we should know whether gold is still in an A-wave or whether the B-wave has begun. There is even a possibility (although remote) that gold could still be consolidating before another leg up in the C-wave. That scenario is dependant on what the dollar does. This entry was posted in Uncategorized on April 19, 2010 by Gary. This entry was posted in Uncategorized on April 16, 2010 by Gary. INTC beat earnings yesterday and this morning the market is loving it. Cramer is wildly bullish. BUY, BUY, BUY! Unfortunately INTC has a history of marking turning points. Let’s just say that buying the gap up on earnings hasn’t been kind in the short term. Buying when INTC has closed at new 52 week highs the day they report has led to losing trades three days later every time. The trend is clearly up and I doubt that we are at a final top for this cyclical bull but is the reward really worth the risk of taking Cramers advice? As of yesterday the market had moved higher 71% of the days out of the February bottom. 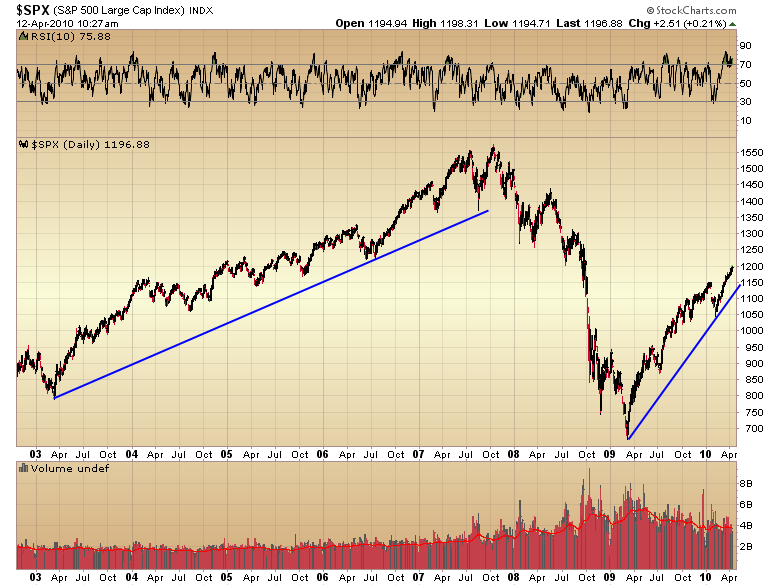 Folks that is verging on parabolic. Those never end well. I liken the current market to playing musical chairs with 10 people but only one chair. Certainly you might catch more upside but almost certainly we are, at some point, going to go back down and test the breakout at 1150. When it happens it’s going to happen quickly. These kind of extreme momentum moves have a tendency to erase several weeks or even months of gains in just a handful of days. 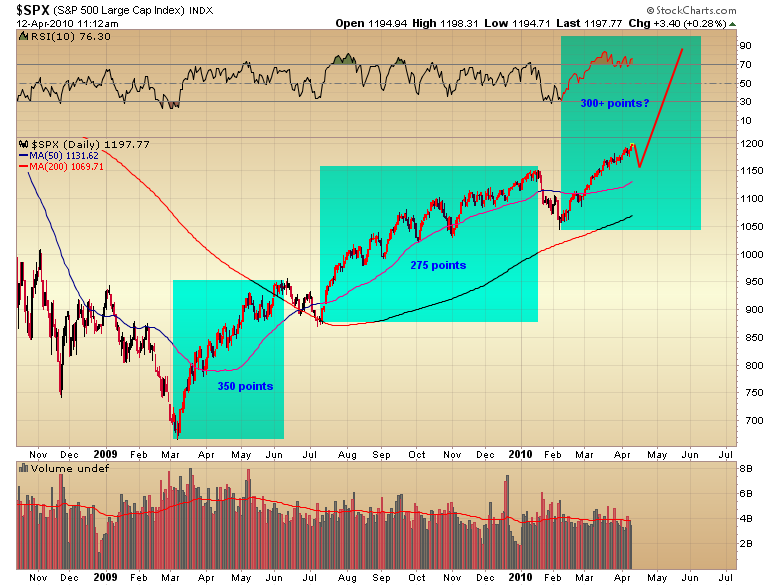 So one has to consider is the minimal upside really worth the risk of getting caught in a vicious correction? At this point one is better off stepping to the side until the correction occurs and then buying back in. Keep in mind I’m certainly not advocating going short. Because who knows how much longer this could go on. But the potential reward just isn’t worth the risk of pressing the long side anymore. This entry was posted in Uncategorized on April 14, 2010 by Gary. Several weeks ago I speculated that we were “On the brink of an asset explosion” . So far events are unfolding about as expected. I might even say they are moving more aggressively than I thought. Well actually, there’s no doubt this cyclical bull is unfolding much more aggressively than anyone expected. Compare the angle of assent of this cyclical bull to the last one. It’s readily apparent what affect the trillions and trillions of dollars central banks have pumped into the system is having. I think Ben has clearly proved his point that in a purely fiat monetary system deflation is a choice, not an inevitability. As long as a country is willing to sacrifice its currency there is no amount of deflationary pressure that can’t be printed away. However, no amount of printing can erase the underlying problems. And those problems are going to persist until they are cleansed from the system. In his mad attempt to avoid the mistakes of the depression Bernanke is going to create a whole new type depression. This time the depression will materialize as a hyper-inflationary storm. What the powers that be fail to understand is that we are going to suffer a depression that is unavoidable when a credit bubble forms and pops. All we are doing is choosing the form of the depression. In this case the memory of the deflationary depression in the 30’s has sent us down the other track into the beginnings of a hyperinflationary state. Going back to our charts you can see that the February correction separated the second leg of the bull from the third and almost exactly matched the `04 correction in magnitude if not in time. Remember everything is unfolding faster this time. I think we have by passed the middle years (2004-2006) of a normal bull market and have now entered the final stages of this cyclical bull. 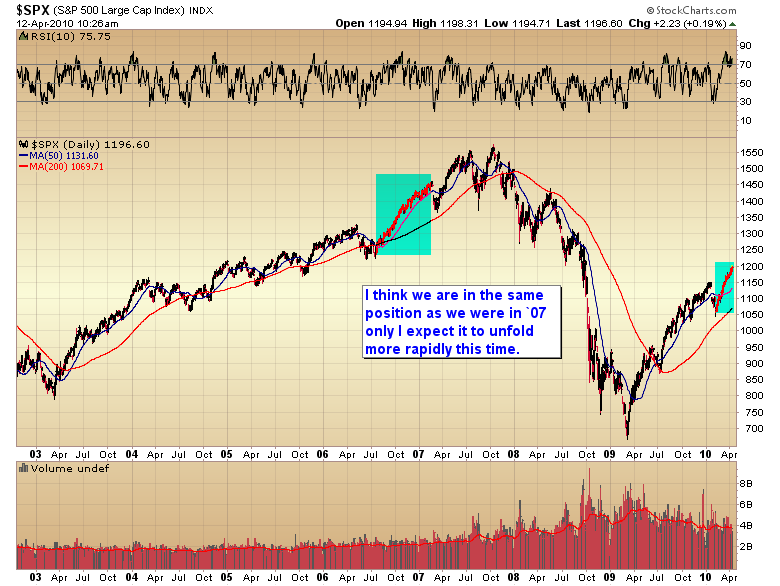 I tend to think we are now in the same state as the runaway move in late 2006 and early 2007. I don’t really expect this stage to last as long as it did during the last bull though. Everything else is unfolding much faster I don’t know why this stage won’t either. Ultimately these extreme momentum moves usually fail dramatically with a violent correction that gives back several weeks or months worth of gains in just a handful of days. I’m expecting some kind of mini-crash (4-6%) at some point during earnings season. 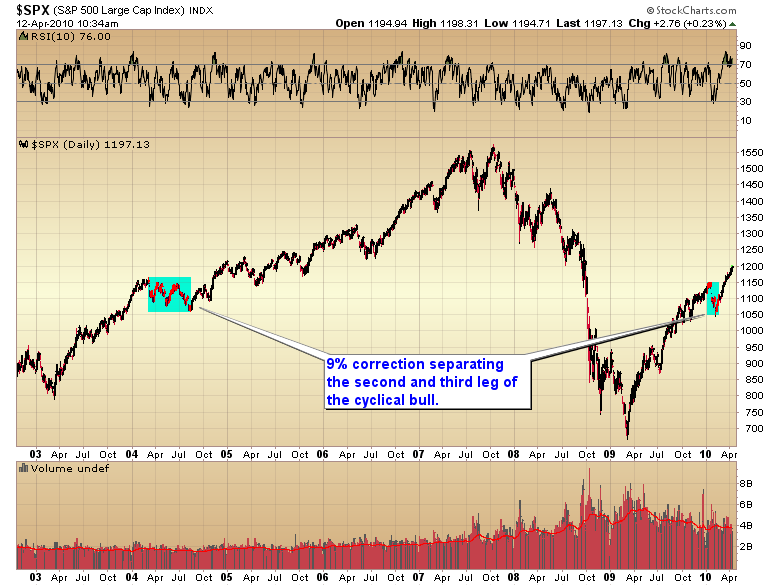 Once that correction has run its course we should enter the final parabolic stage of the bull. That’s when I expect we will really see asset prices explode higher. The first two legs of this bull gained 300 and 275 points respectively. I wouldn’t be surprised if the last leg gains another 300+ points before the whole house of cards comes crashing back down. And what is going to bring it down? The same thing that destroyed the economy in 2008 …oil! Without exception, every time oil spikes 100% or more within a short period of time (one year or less) it has eventually led to a recession. Well Bernanke’s insane monetary policy has virtually guaranteed that will play out again as oil has now risen over 140% since this cyclical bull began. Amazingly enough oil has done this in a very low demand/high supply environment. 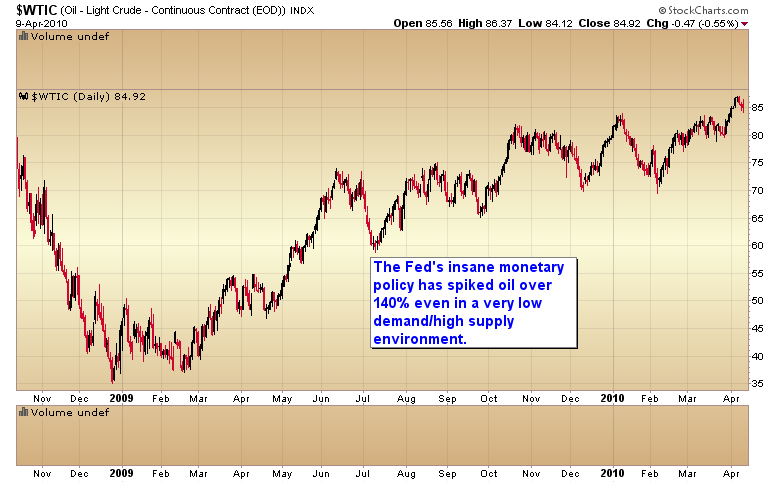 This fact could only be true if the cause for oil’s rise in price is directly attributed to the Fed’s monetary policy. Once the market corrects I think we can back up the truck in virtually any asset class for the final parabolic move as the Fed completely loses control of money supply. We just need to keep in mind this will be an end game not the beginning of a new secular bull. This entry was posted in Uncategorized on April 12, 2010 by Gary. Let me apologize in advance but I just couldn’t resist. If the gold market is manipulated like so many people want to believe, then how in the world did they let gold rally 10 out of the last 11 days?